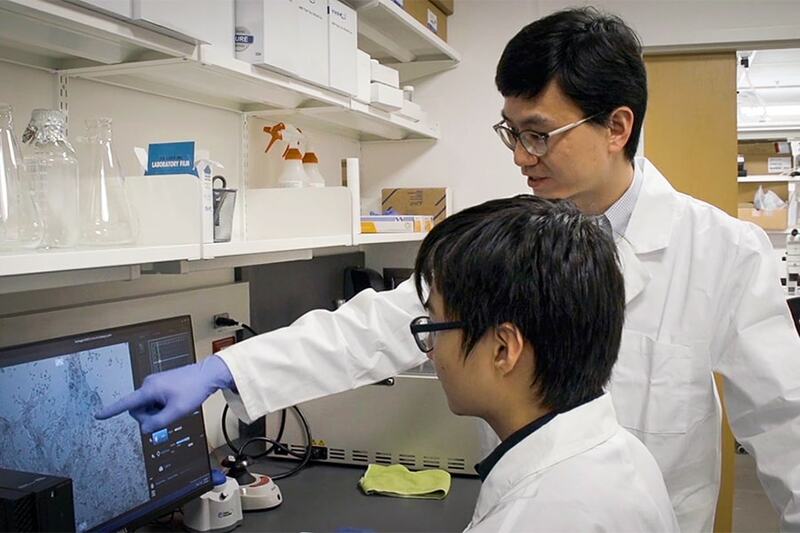 Carnegie Mellon University's Xi (Charlie) Ren could one day help thousands of patients with end-stage lung disease breathe easier. A pair of lungs dangles from the roof of its glass receptacle, a clear liquid dripping into the bottom. The liquid is a detergent, similar to what's used for laundry, and it's carrying with it all of the cells from within the lungs. Once the existing cells have been removed, what's left behind is called the extracellular matrix (ECM), an opaque white organ scaffold that preserves many important features of the lung. This process is called whole-organ perfusion decellularization, a platform technology that Ren, an associate professor in biomedical engineering, inherited from his time in postdoctoral training at Massachusetts General Hospital and Harvard Medical School. An organ is a self-contained functional system consisting of multiple types of tissues integrated in a unique spatial organization, such as the organized respiratory tract and vasculature of the lung. This internal microanatomy of the organ is well-preserved after decellularization, meaning that details such as blood vessels and other parenchymal structures (the functional part of an organ) are evident in the ECM. The scaffold even maintains the biomechanical features of the organ, such as the ability to expand and compress in a lung, or the ability to beat in a heart. Understanding how to manipulate and replicate the ECM would be a major boon for researchers in organ engineering for transplantation. "We hope to provide people with some biologically or chemically selective approach so that they can modify the ECM in a very specific manner," Ren said. "We can study the interaction between cells and the ECM and how that occurs during regeneration, to potentially engineer a much better ECM scaffold as a biomaterial for tissue engineering." Ren received his Ph.D. in genetics and developmental biology from Peking University. Post-doctoral training, he opted for something translational that could have a direct impact on the world of medicine. Thus, he went to Massachusetts General Hospital to work in the Laboratory for Organ Engineering and Regeneration with Dr. Harald Ott. He spent five years with the lab, focusing on regenerating lung vasculature, before joining Carnegie Mellon's Department of Biomedical Engineering and the Bioengineered Organs Initiative in 2017. The point of isolating and altering the extracellular matrix is to provide a backbone onto which to deliver regenerated cells, and ideally, to recapitulate the entire organ. Currently, researchers are able to induce stem cell differentiation, creating and isolating cells of the various tissue types found within the lung. However, one cell — or even a cluster of cells — does not an organ make. While it is possible to deliver the cells to their respective areas thanks to the preserved features of the ECM, influencing the cells to function together as one cohesive organ for an extended period of time has proven challenging. "What I'm trying to do is to combine my previous background in developmental biology with organ engineering to contribute essential knowledge and technologies to move the field of organ engineering forward," Ren said. Ren said he hopes by replicating the in vivo environment, he can achieve better and more cohesive overall function. He's working to induce differentiation of multiple cell lineages side by side within an in vitro environment, a situation similar to what would occur during organ development in vivo. "What people have done is use a highly purified system to study one lineage at a time, but we think at some point we will have to bring other factors in to better mimic the body, so we can potentially get better results," Ren said. Ren's work has seen him partner with leading minds from within and outside of Carnegie Mellon. As a member of the Bioengineered Organs Initiative, he is surrounded by researchers from diverse disciplines, who are brought together to advance the field of organ replacement and regeneration. Currently, he's working with Adam Feinberg, associate professor in the departments of Materials Science & Engineering and Biomedical Engineering, and Keith Cook, professor of biomedical engineering, on the preliminary stages of a project to create a biofabricated lung device. Feinberg will provide the 3D printed extracellular matrix material upon which the lung will be built, while Cook brings to the project a long history of bioartificial lung device research and performance modeling. Ren is responsible for the vasculature. By combining their respective areas of expertise, the team aims to fully leverage the initiative's collaborative advantage. Ren also is working with transplant physicians from UPMC, consulting with medical professionals to discern how his research could improve transplantation techniques. One major issue with transplantation is that organs often exhibit reduced function after transplant. This can be due to an ischemia-reperfusion injury, caused by the time during transport and transplantation in which no blood supplies the lung. "We're trying to find out what's going on during an ischemia-reperfusion injury and during organ preservation," Ren said. "Can we develop a better method to preserve those organs or devise technologies to put some potential beneficial therapeutic molecules onto the donor organ?" Ultimately, the chance to improve lives in real-world scenarios is what motivates Ren and his colleagues' work — that same motivation that prompted him to make the jump from developmental biology to bioengineering in the first place. For thousands placed on the organ transplant list every year, and thousands more dealing with the complications of organ damage, Ren's work may one day mean major improvements in life expectancy and quality.